Julia Pastrana, a Mexican Indian woman born with congenital hypertrichosis, a condition that caused her small body to grow copious amounts of hair and an ape-like protruding mouth, was a 19th-century freak show superstar. Billed as the""baboon lady,"" she spent much of her life--and afterlife as an embalmed corpse--being carted around America and Europe to shock and titillate curious circus-goers and scientists. This reconstruction of her life, often told in the same theatrical, aggrandizing manner a carnival proprietor might employ to hawk admission to a sideshow, fails to insightfully examine the emotional effects of her abnormality or her inhumane exploitation. Rather, Norwegian journalists Gylseth and Toverud capitalize on her unusual appearance almost as callously and unapologetically as Theodore Lent, her manipulative manager and husband. Aside from sprinkled references to her accomplishments (she spoke three languages and was a gifted singer and dancer), the authors dwell little on the intelligent and sentient human being that she was. Lengthy digressions into the lives of P.T. Barnum, Joseph Merrick (a.k.a. 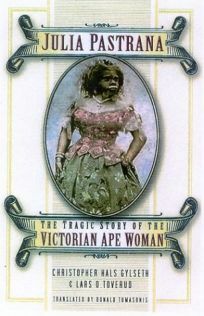 the Elephant Man) and other""bearded ladies"" are interesting, but meander within Julia's own story. Additionally, embellished narration of events, like her obscure birth in rural Mexico, and imagined conversations (Julia supposedly""beamingly accepted"" Lent's marriage proposal) further detract from the book's credibility. Photographs and illustrations of Julia and other circus performers lift the work somewhat, but any opportunity to sensitively investigate her life is squandered here.